1. Attend a beach clean up held by Hawaii Ocean Ambassadors, Sustainable Coastlines Hawaii, or the Surfrider Foundation. There are dozens of opportunities a year to get out and clean up your beaches while having fun with your friends, meeting new people, and taking care of the 'aina. 2. Become a Member of the Surfrider Foundation, donate to Sustainable Coastlines, or become a Wavemaker at Oceana. 3. Host your own beach clean up with your friends. This could be as simple as a small group enjoying a day at the beach together and cleaning up prior to heading home for the evening to bringing together group of friends and neighbors for a more formal, organized clean up. A great resource for planning your own beach clean up is available at Love Your Coast. 4. Take 3 pieces - just 3 pieces! - of trash with you every time you leave the beach. 5. Contact hotels and other businesses and ask that they make greater strides to educate their guests and customers as to the danger of standing on, touching, or otherwise disturbing coral reefs. This can be accomplished through better in-room or on-plane literature, better beach front signage, and by encouraging businesses to donate to conservation groups. 6. Contact your elected officials and request greater trash collection services at beach access points, for better beach front signage about reef preservation, or any other conservation related issues and ideas you may have. Our representatives work for us - don't forget that! Most elected officials we've met or spoken with have been thrilled to discuss these issues with us. They want to be contacted by their constituency. So contact them! 7. Inform yourself. Find out about existing and proposed laws, programs, and projects that could affect our oceans, beaches, and reefs. The more you know, the better you will be able to educate friends and family, vote in a way that best aligns with your interests, and the greater likelihood that you will think of creative new ways to help out. 8. Stop buying and using plastic water bottles. Carry a reusable metal canteen. We cannot stress this enough. 9. Don't purchase items that exploit marine life and our beaches such as coral or shell jewelry, shark products, and the like. 10. 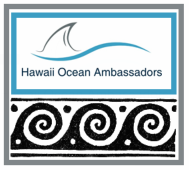 Share Hawaii Ocean Ambassadors with a friend by liking or sharing our page on Facebook. The more interest we get, the greater clout we will be able to summon when discussing better practices with hotels, airlines, island businesses, and government officials. Do this today!